Towing an automobile behind a motorhome adds convenience to the RV camping experience. Trips to the grocery store, excursions into crowded cities or on windy roads are difficult to do in your big rig. Here, I’ll share with you what I’ve learned about the different options for towing an automobile behind your motorhome, and how to do it safely. Depending on what type of vehicle you will be towing, you’ll need to purchase additional accessories and equipment to set up your towing system. It is also crucial that you check with your manufacturer and owner’s manual for the various recommendations and limitations of your tow vehicle. In this article, I’ll describe the pros and cons of each towing option and the different accessories and equipment needed. Then I’ll explain the various considerations and safety concerns involved with towing. Finally, I’ll discuss the best makes and models of vehicles for towing behind a motorhome. 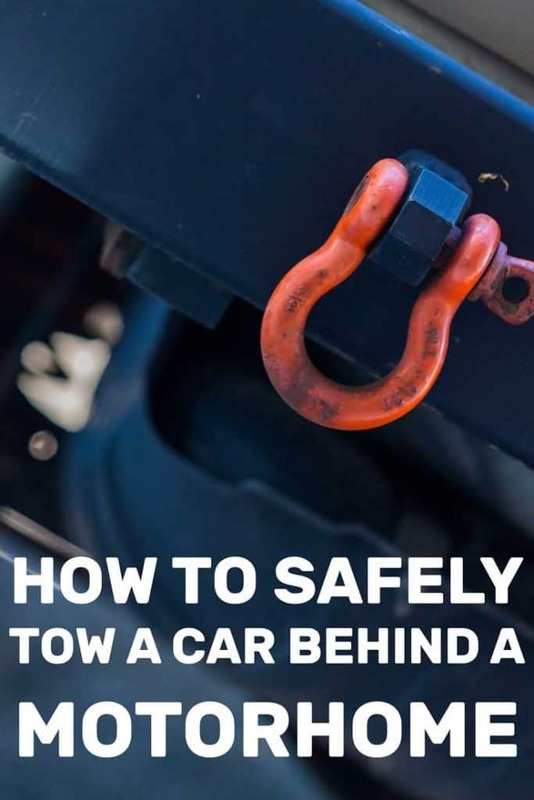 Read on if you’re ready to learn all you ever wanted to know about towing an automobile safely behind your motorhome. As mentioned above, there are three different methods for towing a vehicle behind a motorhome. The bulk of this article will focus on flat towing, or 4 wheels down because it is the most common, and it also has the most safety considerations. This method of towing is known by several names: four wheels down, dinghy towing, flat towing, or the TOAD method. It is the most common way for RVs to tow a vehicle behind them. When referred to as dinghy towing, the vehicle being towed is the “dinghy.” The term “TOAD” also refers to the vehicle that is being towed. In this method, the dinghy has all 4 wheels on the ground and is connected to the motorhome with a tow bar system. I will go into the pros and cons of this method later in the article when I dive deeper into the four wheels down method. This method of towing is described in its name. A dolly attaches to the back of the motorhome and the towed vehicle rides with two tires up on the dolly, and two tires down on the ground. One benefit of dolly towing is that you won’t be limited on what kind of car you can tow. Any front wheel drive vehicle can be towed this way, without worry about damage to the transmission. Another bonus to dolly towing is that you won’t increase the mileage on your towed vehicle while it’s going down the road. One downside of dolly towing is the cost. It is expensive to buy a good quality dolly trailer. Additionally, since most states require a separate license for the dolly, that is another expense. Another con to this method of towing is that a dolly trailer adds a lot of weight to the overall capacity of your motorhome. Drivers using this method need to calculate weight carefully. A further challenge with a dolly trailer is that backing up or reversing will be difficult. Finally, the dolly can present a storage challenge. Even if you have space to store the dolly trailer at your home, some campgrounds have limited space for parking. The dolly trailer can be awkward to remove and store at a campsite. This method of towing is similar to the previous one, dolly towing. The only difference is that the towed vehicle has all four wheels up on a flatbed trailer. The trailer is attached to the motorhome, and the towed vehicle is anchored down to the trailer. Any vehicle can be towed on a flatbed trailer, as long as it can be driven up and secured down. Even multiple vehicles or golf carts, ATVs, etc. can be towed on a trailer with 4 wheels up. Like the dolly trailer method, the drive shaft is off the ground, and no miles will add up on the odometer. In this method, the tires of the towed vehicle will be spared any wear and tear. The flatbed trailer has similar disadvantages to the 2 wheels up method. The cost to purchase and license the trailer is more expensive. The weight of a flatbed trailer will be heavy and eat up overall weight that the motorhome can carry. Storing the flatbed trailer will also be inconvenient at campgrounds with less space for parking. Now let’s go back to the first method I mentioned, 4 wheels down towing. It is the most common method used, yet there are many things to consider to do it safely. 4 wheels down is the most cost-effective method for towing. The equipment needed to attach a car by a tow bar is cheaper than investing in a dolly or flatbed trailer. Another benefit to 4 wheels down towing is storing a tow bar is much easier than storing a trailer. There is also no need for a separate trailer license when towing 4 wheels down. The main downside to towing a vehicle 4 wheels down is that not all vehicles can be towed this way. If you try to tow a vehicle that is not factory certified to dinghy tow, you can cause serious damage to your vehicle. It will also invalidate the manufacturer warranty. Research is needed to ensure that you have the right kind of vehicle as your dinghy in this method of towing. Why can’t any vehicle be towed with 4 wheels down? Even rugged cars that seem like they would be perfect for towing, might not be towable as a dinghy. Likewise, a vehicle model that was safe to tow in 2017, may not be safe to tow 4 wheels down in the 2019 model. Always check the owner’s manual for any vehicle you are considering towing. Call the manufacturer. Do the research online. The factory guidelines should be very clear about whether or not a particular make/model and year are able to be “flat towed” with 4 wheels down. Each automobile is different and is designed with different functions in mind. That being said, there are various reasons why a certain automobile should not be towed as a dinghy. But these are the most common concerns when choosing the right car to flat tow with 4 wheels down. The main concern in most cases is the transmission. Many vehicles require a pump to be continuously moving to supply the transmission with the lubrication it needs. Usually, automatic transmissions need this pump as well as some pump-dependent manual transmission automobiles. When a vehicle is being pulled with all 4 wheels on the ground, but the engine isn’t running, the transmission isn’t getting the lubrication it needs and major transmission damage can occur. In some models, the manufacturer allows the car to be dinghy towed, but certain precautions need to be taken to make sure the transmission is not damaged. For example, some vehicles require starting the engine of the dinghy every 200 miles so that the transmission fluid can get circulated through the system properly. The battery and electrical system can also be a concern when towing 4 wheels down. Some models have requirements for the position of the ignition switch while being towed. The steering column needs to stay unlocked and electricity allowed to flow for the battery to stay fully charged. Even though the dolly trailer and flatbed trailer add much more weight than towing with a tow bar, the weight of the vehicle still needs to be considered. Make sure the combo of the dinghy plus accessories does not exceed the motorhome’s GCWR (gross combination weight rating). There are a couple of modifications that might allow some vehicles to be safely towed with 4 wheels down. At the same time, these modifications may also affect the vehicle’s warranty. Before adding any of these modifications to your automobile, always check with the manufacturer to see if these modifications are recommended and how they will affect your warranty. This part can be installed on automatic transmission vehicles. It disconnects the drive shaft from the rear axle, preventing damage to the transmission. The decoupler can be installed on the rear part of the drive shaft. It will connect to a lever under the driver’s seat which can be pulled to disengage the parts. When disconnected, the rear axle can move freely without turning the drive shaft or transmission. This part can be used on automatic transmission vehicles or pump-dependent manual transmission cars. Its purpose is to keep the transmission fluid moving into the transmission and keeping it cool while the car is being towed. There are different types of lube pumps to choose from. As always, it’s important to research which kind of pump is recommended for your dinghy, or TOAD vehicle. 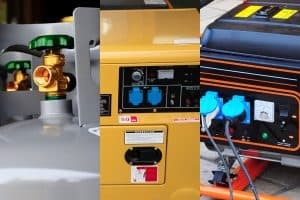 Some pumps get their power from the motorhome engine. Other models have electronic monitors so the driver can keep an eye on how the lube pump is working while in motion. These modifications might allow your vehicle to be safely towed as a dinghy but check with your manufacturer and owner’s manual for their recommendation. They create an additional cost and require a skilled installation. I have a factory-recommended dinghy, what else do I need? Choosing your dinghy and making sure it’s safe to tow, is the most important decision to make. But once you’re sure you’ve got the right vehicle to tow, there are still a few more things you need to do before hitting the road. 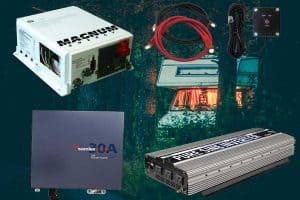 There are many different tow bar products out there for connecting your dinghy, or TOAD, to your motorhome. The most important factors to consider are the safety rating and that it is installed properly. Here is a breakdown of the different parts of the tow bar system. This is the part that attaches to the back of the motorhome. The rating of the hitch receiver must match the maximum weight that you intend to tow. Most hitch receivers need to be adjusted for the height of the chosen dinghy. Drop receivers can be bolted in place to adjust the height of the receiver from 2-10 inches. There are two basic types of tow bars: an A-frame or self-aligning tow bar. A-frame tow bars are more budget-friendly. They are heavy and strong and require more storage space when not in use. Self-aligning tow bars can be mounted to either the dinghy or the motorhome. These units are easier to work with than the A-bar, and can make hitching a one-person job. Self-aligning tow bars can fit on a wide range of vehicles with the correct baseplate installed. This is hardware that is secured to the frame of the dingy vehicle, which allows the tow bar to be connected safely. Each baseplate is different according to the make, model and year of the dinghy. You need to make sure you purchase the bracket or baseplate that is specific to your TOAD. Proper installation is also critical. Today’s modern baseplates are streamlined and blend seamlessly into the exterior of the towed vehicle. Trimming, bumper removal and drilling may all be necessary to properly install the baseplate. Depending on how complicated a particular baseplate attachment is, consider hiring a professional to install these parts. This are in place to keep the dinghy attached in case the tow bar fails. All 50 states require these. They are connected to the dingy, crossed under the tow bar, and secured to the hitch receiver. Almost every state requires a towed vehicle to have auxiliary brakes. Even if you are driving in a state that does not mandate this, it is still a smart safety precaution to have. As with the other equipment mentioned above, it’s important to choose the brake system that works best with the particular make and model of dinghy you’re towing. The function of an auxiliary, or supplemental, braking system is to apply pressure on the dinghy’s brakes whenever the brakes are being applied in the motorhome. It allows the motorhome and dinghy to come to a stop more efficiently together. In cases where a driver needs to stop quickly, the auxiliary brakes are important to have. Some braking systems work by using a slide receiver in the tow bar to apply pressure to the brake system in the TOAD. Others use sensors or electrical current to detect deceleration in the motorhome. Then the brakes in the TOAD will be deployed when deceleration is detected. Check with your manufacturer and ensure that you purchase the auxiliary braking system that’s best for your motorhome and dinghy combination. Then, have the braking system installed by a skilled technician. Even with the best safety precautions and preparations made on your motorhome and dinghy towing combinations, accidents can still happen. Driving safely is a very important part of the equation when it comes to towing a car safely behind a motorhome. Here are a few basic, but essential guidelines for driving safely while pulling a TOAD. Obey the speed limit for towing in each state. Plan your route ahead of time. Backing up is not recommended while dingy towing, so always have a clear entrance and exit point. Avoid towing in snowy or icy conditions. Keep a minimum of a five-second interval between you and the vehicle in front of you. Stay away from towing in deep sand or gravel. Avoid tight turns while towing, which can put unnecessary pressure on the tow bar. Inspect all wire and cable connections each time you stop. Which cars are most popular to tow behind a motorhome? The ideal vehicles for dinghy towing have a manual transmission with front wheel drive. However, even if a car has a manual transmission with front wheel drive, check your manual to make sure that your dinghy is safe to tow with four wheels down. Historically certain makes and models have been well-suited for towing dinghy-style. These brands include Jeep, Ford, Chevy and Honda. In the past, it has also been recommended to avoid towing any automatic transmission vehicles made by Toyota or Lexus. Since the makes and models change year by year in their design and their ability to be towed, we won’t make specific recommendations here. We do encourage you to carefully research which brand of vehicle you should choose for towing. We can recommend a Good Sam publication that gives specific guidance on vehicle makes and models that can be safely used for 4 wheels down towing. This guide to dinghy towing is revised every year, so you’ll have the most accurate information at your fingertips. 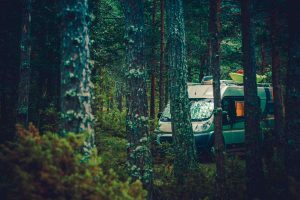 We hope this article provided you with helpful information and clears up any questions you had about towing a vehicle safely behind a motorhome. By following these guidelines and the safety recommendations for your vehicles, you’ll be enjoying camping with an extra vehicle soon! Got your own tips to share? Leave a comment so others can learn from your experience! Previous PostWhat Should I Put in My RV Black Tank? Next PostWhere Can I Park My RV Long-Term?